"Sun Moon Earth: The History of Solar Eclipses from Omens of Doom to Einstein and Exoplanets" (Basic Books, 2016) by Tyler Nordgren. Throughout history, solar eclipses have transformed from terrifying omens into the subject of scientific study, inspiring eclipse chasers to travel the world to witness the natural phenomenon. The total solar eclipse on Aug. 21 is expected to draw millions of skywatchers to the path of totality, which is about 70 miles (113 kilometers) wide and goes from Oregon to South Carolina. 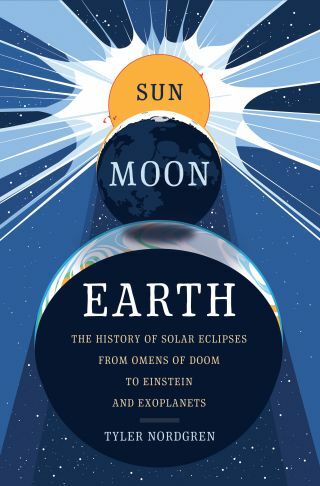 Tyler Nordgren's book "Sun Moon Earth: The History of Solar Eclipses from Omens of Doom to Einstein and Exoplanets" (Basic Books, 2016) traces the natural history of eclipses and how the interpretation of such events has changed over time. With the Aug. 21 total solar eclipse just around the corner, Space.com spoke with Nordgren about his book, the history of solar eclipses and the science behind the shadow. Space.com: Why do we have solar eclipses? Tyler Nordgren: We have solar eclipses because we're lucky enough to have a moon that is just the right distance from us, so it appears to be the same size in the sky as the sun. So, about twice a year, we go through a period where the moon passes in front of the sun at new moon and then the moon passes through the shadow of the Earth at full moon. And so we get solar eclipses and lunar eclipses. Space.com: Why is the path of totality different for each solar eclipse? Nordgren: A total solar eclipse happens roughly every 18 months … so the position of the moon, its distance from Earth, when it crosses in front of the sun — these things change every single time [an eclipse occurs] because we don't live in a perfect clockwork universe where the moon takes exactly 30 days to go around the Earth and the Earth takes exactly 365 days to go around the sun. Every time the alignment works out, the Earth is in a slightly different place in its orbit around the sun, [at a] slightly different time of day. So those paths — those dark shadows that the moon casts across the Earth — trace a slightly different path across the planet, which is why we have gone 38 years without seeing a total solar eclipse here in the continental U.S.
Space.com: What are some of the most significant contributions solar eclipses have made to the field of science? Nordgren: The Greek philosopher Anaxagoras from about 2,500 years ago … he was really the first person that we can identify from Western culture that quickly identified what caused eclipses — that they were play of light and shadow from the sun on the moon and the Earth. Once he realized that, he was able to make some really startling conclusions. One is that if a total solar eclipse is the moon moving in front of the sun, that means that the moon has to be closer [to Earth] than the sun [is]. Secondly, because [the moon and the sun] do appear to be about the same size in the sky and the sun is farther away, that means that the sun has to be bigger [than the moon]. So now you've just figured out relative sizes. Space.com: How has understanding the clockwork of the sky allowed civilizations to evolve? Nordgren: We could use the timing of these eclipses to better calculate things like the orbit of the moon and the day of the year … If you think about it, a calendar keeps track of the sun — we know that one year goes by when the sun comes back to the same place. A month is the time it takes the moon, approximately, to go around the Earth. So, whenever you have eclipses, you can keep track of where the moon is. For much of human history, these eclipses helped us keep better track of our calendars, and calendars are what allow you to celebrate the seasons and the solstices, as well as birthdays, Christmas and Easter [among other holidays and events]. We have a lot of religious traditions and celebrations that hinge upon keeping track of the seasons, and the motion of the moon and the sun. Space.com: Can you explain the sun-moon-Earth relationship and how it controls whether we see a solar eclipse? Nordgren: The reason we have a moon in the first place is because there appears to have been some sort of enormous impact early in the formation of Earth, soon after it came into being 4.5 billion years ago — and that moon has been slowly spiraling away from Earth ever since. The rate at which it spirals away depends on tidal forces between the Earth and the moon, which depend on the oceans and the placement of the continents. As continents slowly drift across the [Earth's] surface, you get more or less friction between tidal bulges — the big bulges of water that the moon sweeps across the Earth — and the seafloor. So, more or less energy gets dissipated through friction, which speeds up or slows down the moon as it slowly spirals away from Earth. All of this has an effect on [people on Earth] being able to see a total solar eclipse. Eventually, about 600 million years from now, the moon is going too far away to fully cover the sun, so we will stop having total solar eclipses. But exactly what date that [will] occur [on] and exactly what continent gets to see that last totality — we can't tell that, and that's because of continental drift, or the changing positions of continents. Space.com: Do other planets in our solar system experience solar eclipses? Nordgren: No other planet-moon combination in our solar system has a moon that is exactly the right size and exactly the right distance to perfectly cover the sun. Jupiter has four large Galilean satellites, and those moons are each about the same size as our moon. But Jupiter is about five times farther away from the sun than we are, so the sun appears quite small. Eclipses happen — those [Galilean] moons will totally blot out the sun — but those moons are so large that they completely cover the [sun's] corona. Space.com: Has a similar relationship been observed on any planet outside our solar system? Space.com: You've discussed that a relationship between Earth and the moon makes life possible. Can you elaborate? Nordgren: The moon does really interesting things for the Earth. One, by having this really large moon orbiting the Earth, it keeps the Earth's obliquity — the angle that our rotational axis makes with the sun — stable, so that we have a constant 23.5-degree tilt, which gives rise to the seasons. Mars, however, has no such moon and appears to have a random tilt, which, throughout history, has wobbled enormously. So Mars has gone through much warmer and colder periods. If [Earth] didn't have this really large moon, we would lose the stability of the seasons on Earth, and that stability of the seasons is one of the reasons why the Earth has remained habitable. We've never gotten outrageously hot or outrageously cold — we've always stayed relatively constant, and that is something that has been very important for the evolution of life, especially intelligent life. This interview has been edited for length and clarity. You can buy "Sun Moon Earth" on Amazon.